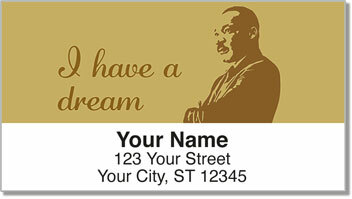 Share Dr. Martin Luther King Junior's dream of freedom, equality and hope for a brighter future with everyone on your mailing list. 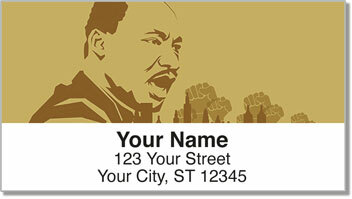 These unique return address labels feature illustrations of the great civil rights leader as well as some of the most powerful words he ever spoke. They will inspire you and anyone who sees them to fight for what's right, just as he did. 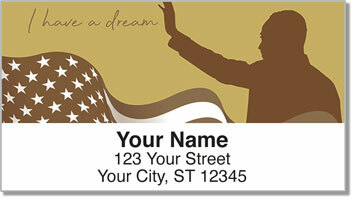 Martin Luther King Address Labels are an original finishing touch for your letters and packages, but they are also very convenient. Just peel and place the self-adhesive labels and forget about the painstaking process of printing your name and address. 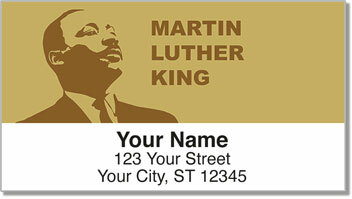 Order your own Martin Luther King Address Labels now! They are also available as matching checks.